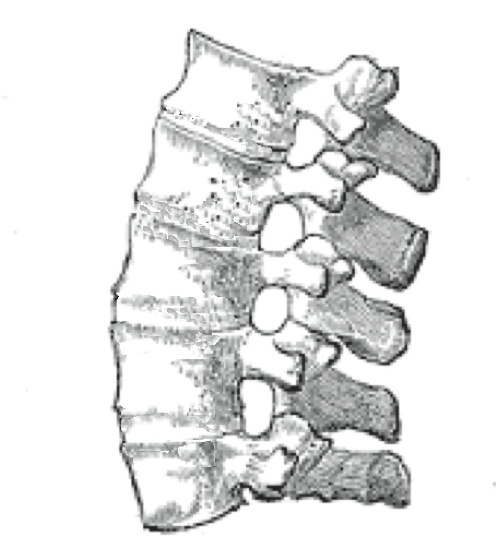 An ankylosing spine in which the vertebrae become fused together. Picture is made with an image of the spine taken from Gray’s Anatomy. Now, the German study by Poddubnyy et al. demonstrated that combinations of specific biomarkers with clinical parameters might help rheumatologists to identify ankylosing spondylitis patients with bad prognosis already at the early disease stage. Active and appropriate treatment of such patients may improve a long-term outcome and prevent or retard progression of spinal damage. For the AS study, patients were divided into two groups: Group I patients, the “progressors”, had syndesmophytes at baseline and new syndesmophyte or syndesmophyte growth after two years. Group II patients, the “non-progressors”, had syndesmophytes at baseline but no progression after two years. A syndesmophyte is a bony growth originating inside a ligament. Commonly, it is seen in the ligaments of the spine. In AS patients, syndesmophytes are regarded as the strongest predictor of further damage. …this will help us stratify our patients due to risk … [this research] may, in the future, pave the way for more treatment options [for ankylosing spondylitis] that target specific markers to be developed. The researchers found key inter-group differences between the “progressors” and the “non-progressors”, who were at risk for progression due to the presence of syndesmophytes and elevated CRP at baseline. Those patients whose disease progressed had significantly higher serum levels of the biomarkers matrix metalloproteinase 3 (MMP3), bone-morphogenetic protein (BMP) 2, procollagen type II N-propeptide (PIINP), and vascular endothelial growth factor (VEGF), and they had lower levels of the biomarker osteoprotegerin (OPG), indicating that these may predict the progression of structural damage. Ankylosing spondylitis, which sometimes is also called Morbus Bechterew, describes the condition where some or all of the joints and bones of the spine fuse together. More common in men, the disease mainly affects the spine but can also affect other joints, tendons and ligaments. The overall prevalence of AS is 0.5-1% of the general population. According to the Arthritis Research Campaign, ankylosing spondylitis is one of the three most common forms of inflammatory arthritis, together with rheumatoid arthritis and psoriatic arthritis. The etiology of Morbus Bechterew is not understood completely. However, a strong genetic predisposition does exist. A direct relationship between ankylosing spondylitis and the HLA-B27 gene has been determined. The precise role of HLA-B27 in precipitating Bechterew’s disease remains unknown. However, it is believed that HLA-B27 may resemble or act as a receptor for an inciting antigen, such as bacteria. 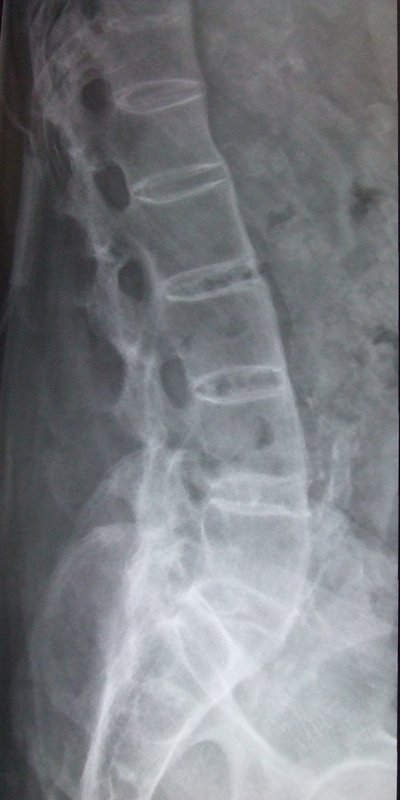 This x-ray of the lateral lumbar spine demonstrates what happens in ankylosing spondylitis, syn. Morbus Bechterew: some or all of the joints and bones of the spine fuse together. The data presented at EULAR congress in Berlin (abstract No. OP0091: “Prediction of radiographic spinal progression using biomarkers in patients with ankylosing spondylitis who are at high risk for progression”) demonstrate that combinations of biomarkers with clinical parameters might help treating rheumatologists to identify ankylosing spondylitis patients with bad prognosis already at the early disease stage. Active and appropriate treatment of such patients may improve a long-term outcome and prevent or retard progression of spinal damage. Pictures are taken from the Wikimedia Commons Project: drawing “Ankylosing“, x-ray picture “Ankylosing spondylitis lumbar spine“. Does anyone have any research on if anklylosing spondlylitis can be the reason clots are thrown from people who have antiphosphidlipid syndrome? Dad, two twins and brother all suffer from a.s. however one twin has the a.p. Could it be that the clots are being thrown because the body is reacting to pain caused by the a.s? If the a.s was now managed, could the a.p.s subside? Thank you for posing this question. First and foremost, I have to stress, that you should NOT quest for personal medical advice via the internet. Every patient and every disease is individual and I strongly recommend that you discuss these issues with the medical doctor of your confidence. He or she can also explain if and how the treatment for one of the diseases may possibly have an impact on symptoms of the other condition. However, I can give you a short outline on the pathogenetic background. Ankylosing spondylitis and antiphospholipid syndrome are different diseases, but they have something in common:They are both autoimmune diseases. Common to all autoimmune diseases is a malfunctioning of the immune system, which can no longer differentiate between a pathogenic invader and the tissues of its own body. The immune system which is normally acting as a protective shield against bacteria and viruses, then turns against the body itself. Autoimmune diseases can affect every organ in the human body. Correspondingly, the symptoms of these diseases vary greatly depending on which organs or structures in the body are attacked by the immune system, and on how far the disease has progressed. In ankylosing spondylitis for example, the bones of the spine are predominantely affected, in antiphospholipid syndrome various proteins in the blood are targeted, reasulting in increased suseptibility for thrombosis. Research has shown that there is a genetic predispoition for autoimmunity. Many autoimmune diseases occur more frequently within families, and there may be an increased tendency toward autoimmune diseases, like it is in your family.